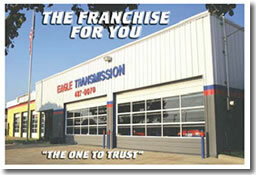 If you are looking for information on the Eagle Transmission franchise business opportunity, Eagle Transmission franchises or Eagle Transmission franchising, then you have come to the right place. We fix Transmissions. We fix automotive problems. We help folks get as much out of their vehicles as possible. We have a good reputation, and we're looking for good franchise owners to grow with, too. It's Time to Shift into High Gear. We're Eagle Transmission. We've helped a lot of folks, and fixed a lot of transmissions since 1983. We've got the track record, management team and the proven results to help you succeed in your own Eagle Transmission Center. We want owners with leadership skills. You don't need to be a mechanic to own your own Eagle Transmission Center. In fact, if you have business experience and understand marketing, you will have a solid advantage. For complete franchise information contact us today! In a slow economy, people buy fewer new cars and fix the old ones. We're not the cheapest, but our trustworthy repairs help our customers save money. The number of vehicles on the road increases by the millions every year. Folks are driving their cars and trucks longer - up to 7 or 8 years or more. The price and technology of new vehicles keeps increasing each year. The Auto After-Market Industry is approaching $200 Billion per year. 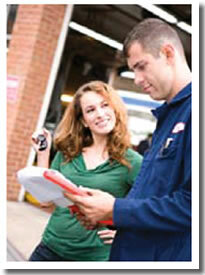 Specialization has replaced full-service--from oil changes to transmission repair. It's a fact: when the economy softens, more folks buy franchises than ever. Why? Many reasons, like controlling your own destiny, being your own boss, getting in an industry that's growing, and making more money than a salary provides. Whatever your reason, it's time to "Soar with the Eagles." Franchising is the fastest growing business system in the world. Franchising accounts for about one third of all retail sales in the US. Service-based franchises are one of the fastest growing business segments. Franchises generally exceed independent businesses for longevity. Franchises offer experience, proven systems, training and support. Our customers trust us for technical expertise and reliable repairs, and referrals make up a large part of our business. You may want to specialize in transmission repairs only, or you can offer other repair services, from air conditioning repair to brakes and general repairs, the choice is yours. We offer you a complete business franchise: a strong brand name; thorough training, support and marketing assistance; location evaluation and lease negotiation assistance; employee recruitment, and training.